There are also added electronics for monitoring the battery pack voltage. 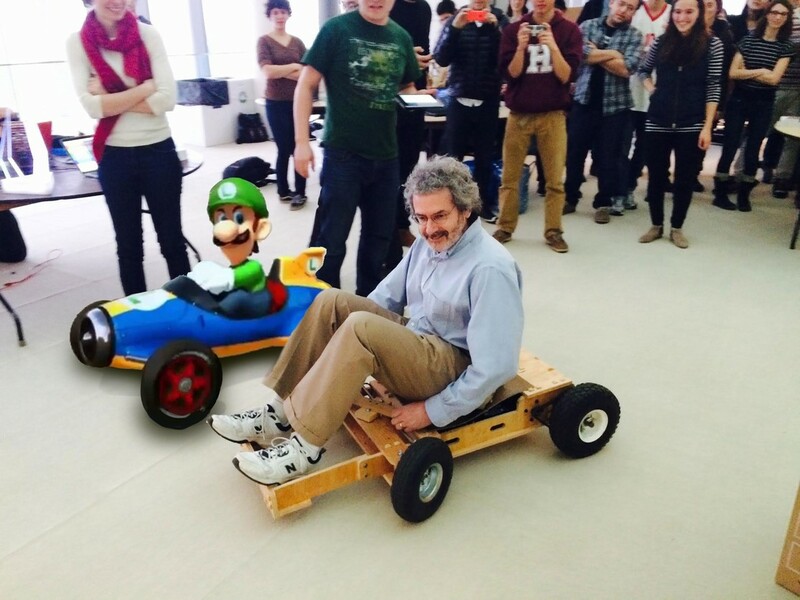 The go-kart was quite a hit at the final project demos. Here’s Neil giving it a spin! If one were to buy all these parts for a new design, it would probably cost a few hundred dollars. However, I collected them from eBay during college for a fraction of that price, and will be designing a vehicle around them. Apart from the above parts, I spent less than $50 from Home Depot to buy a 4’ x 8’ sheet of plywood and a few bolts. 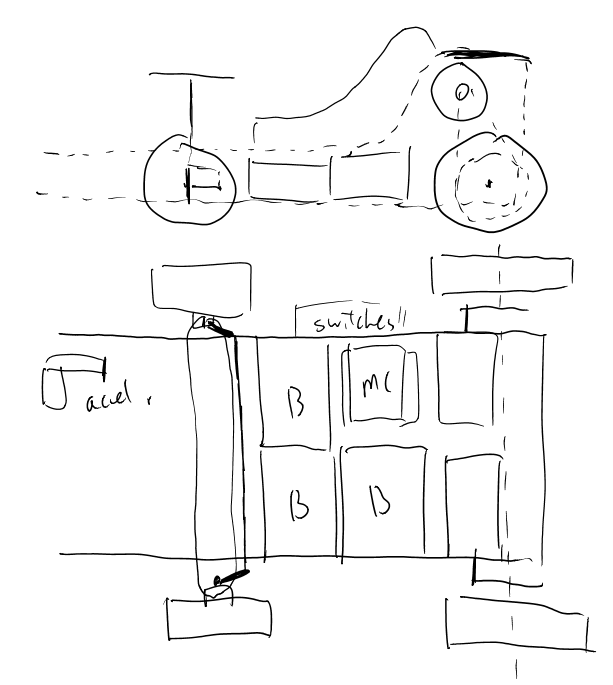 Here’s a sketch from the planning phase of this project, showing the general layout of the vehicle. The overall design of the go-kart uses two separate motors to avoid the need for a differential, the lack of which would create significant wheel slip around turns. The chassis will be relatively compact, with the power electronics tucked in the area between the front and rear wheels and underneath the seat. The driver’s legs will extend over the front wheels, “Mario Kart” style. My sketch also shows approximate Ackermann steering, which reduces wheel slip around turns. However, this wasn’t incorporated in to the design below due to time constraints. 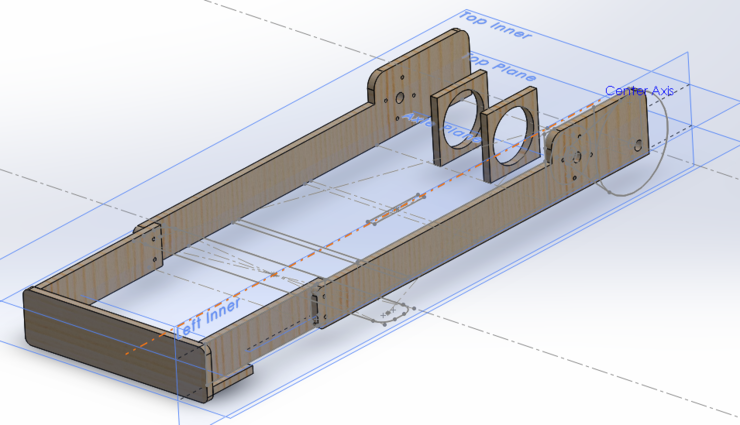 I started out designing the chassis in SolidWorks using the master modeling technique, which uses a core set of sketches in one part to derive other parts in a top-down fashion. The initial set of sketches comprise the width and length of the frame, as well as the power transmission. Using these sketches, I then add various pieces of the frame. First are the left side panels and motor mounts. The front extension, where the driver’s feet rest, is removable to reduce the overall length of the go-kart for easy transportation. 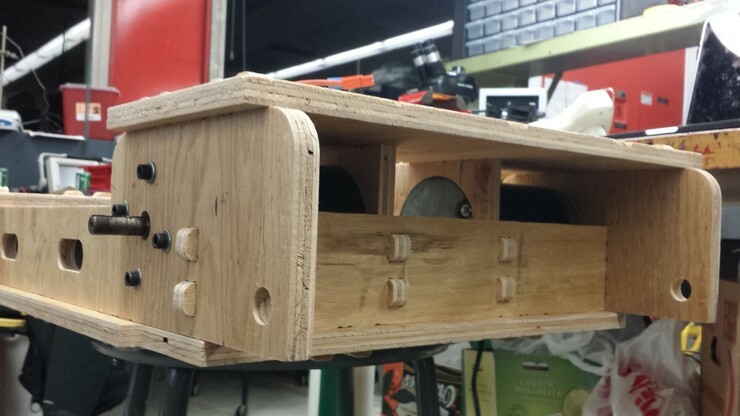 A few more pieces are added for the steering mechanism, and the top and bottom panels. At this point, note that there is still nothing specified on how the pieces are held together. This is where the press-fit part comes in. Using what I learned from week 4 and improving my technique, I realized that an easy way to create press-fit geometry is to create tabs and cutouts in two steps. 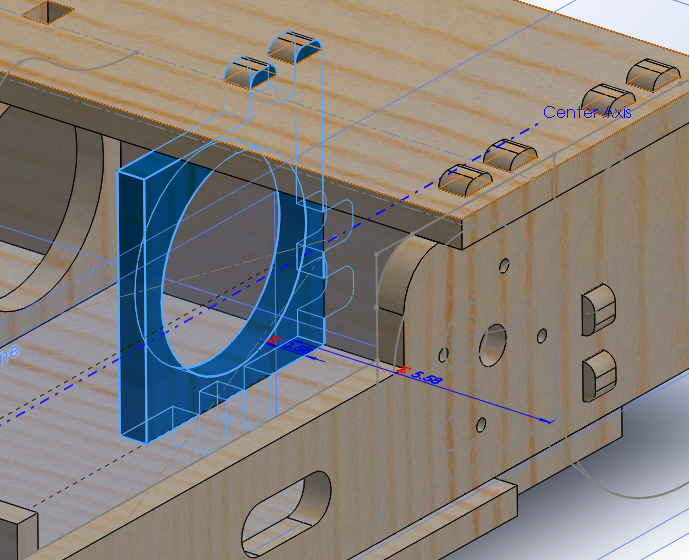 First, I use Blocks in SolidWorks to create a tab pattern that can be added to many pieces in the part. This picture shows tabs being added to the left side panel as part of an Extruded Boss feature. When doing this, make sure to select specifically which existing features to merge with. Next, I use the left side panel itself to create an Extruded Cut through all pieces that intersect with the tabs, using the two faces of the panel to constrain the cut. This automagically creates slots that correspond to the location of the tabs—and more importantly, the slot positions will self-update if any of the tabs are changed! One thing to note is that this technique can even be used to make cuts outside of the plane of the part that is being used to make the cut. In the above picture, the left and right sides are symmetric, so I’ve used the left side to make appropriate cuts on the panels intersecting the right side, without needing to add tabs on the right side itself. In a production model, one might want to design all pieces as they would be produced, but this use of symmetry saves some time for the final project crunch. Here’s a closeup of the motor mount area. One side of the motor has four mounting holes in a square, and is bolted to the wall of the chassis. 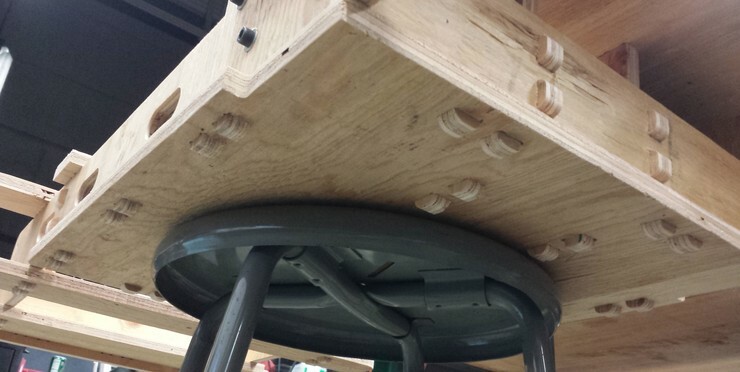 The other end is nestled inside a part that perfectly fits around its diameter. This will help keep the motor straight so that the chain drive is smooth. 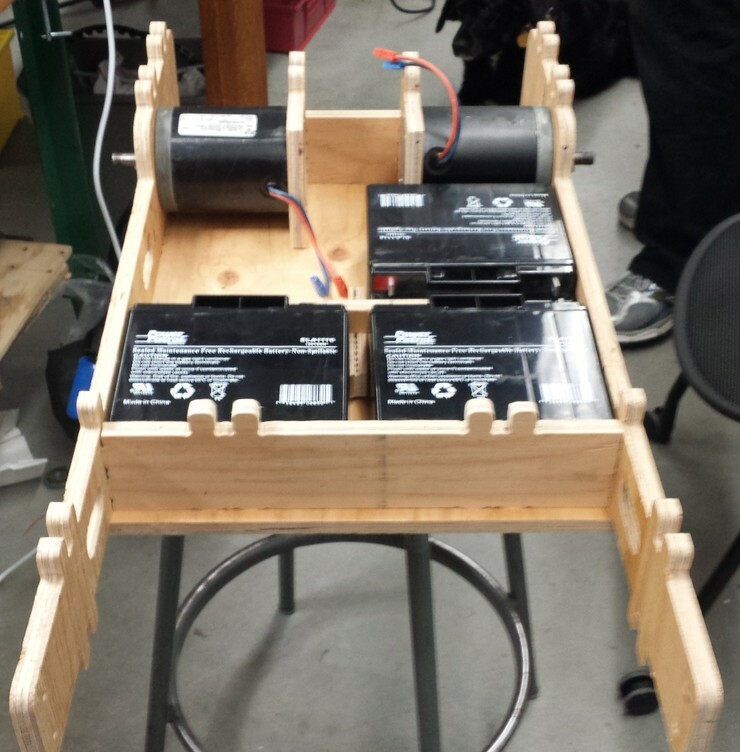 The inner motor part serves multiple additional purposes, including supporting weight from the top panel, transferring it to the rear beam using a set of tabs, and also serving as a stop to position the batteries. The master part contains several values for the entire model to change parametrically. The original design actually called for two types of plywood—thick and thin, but I opted to get just one intermediate type and set both of these to the same value to simplify the cutting process. 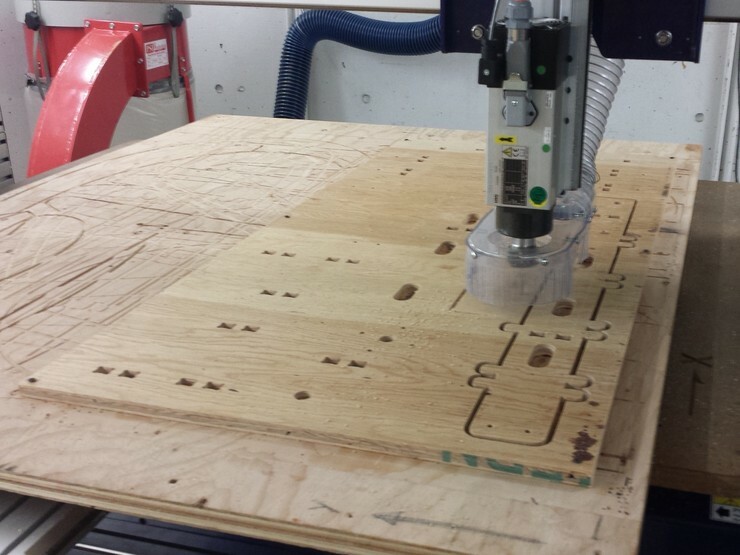 Because of this parametrization, this change automatically updated the parts after I measured the plywood I purchased, with no manual modification needed for cutting. At this point I went to Home Depot and got a 4’ x 8’ sheet of plywood. I used their saw to cut it in half, but it turns out that even a 4’ x 4’ sheet is impossible to get into a passenger car. I ended up cutting those in half again to obtain four 2’ x 4’ sheets. 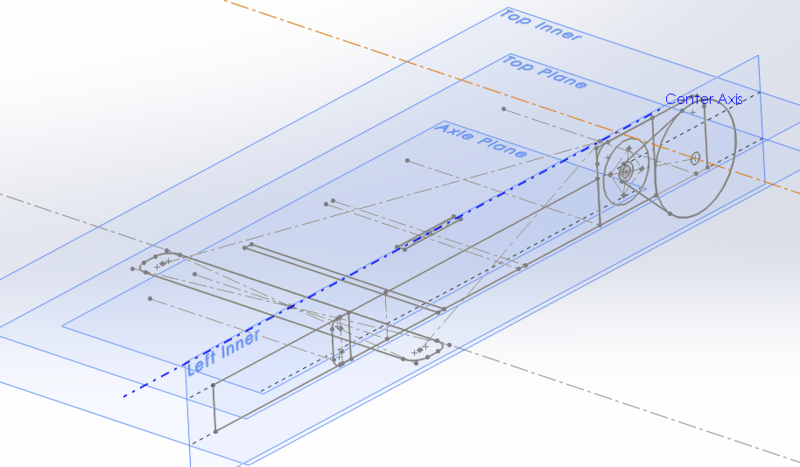 After exporting the faces of each part from SolidWorks, I created toolpaths for cutting out the slots and profiles in VCarve Pro. One neat trick I discovered this week was the use of layers: by selecting all of the outlines and sending them to a separate layer from the holes, I could efficiently generate the two separate toolpaths by specifying a layer instead of individual vectors. 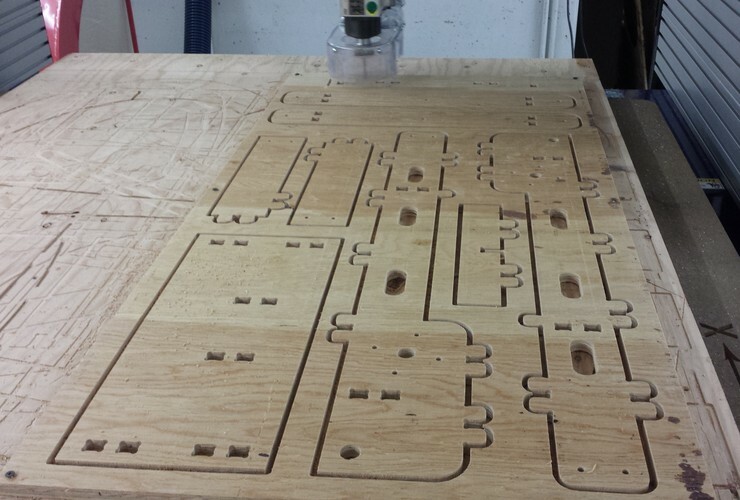 Cutting out all the holes first is desirable as parts can move after the outline is cut. 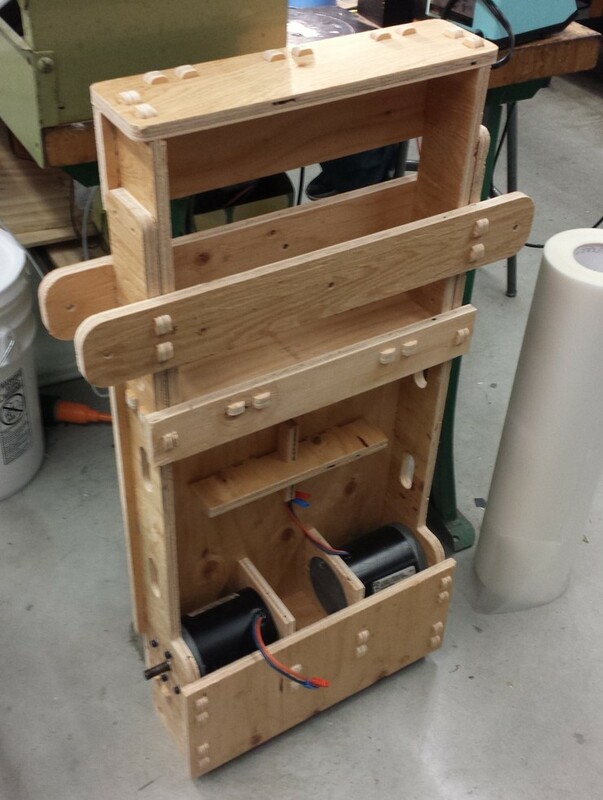 The first sheet, near completion, including most of the side panels and the steering supports. This is the second sheet, including the large bottom panel, some horizontal beams, and the motor mounts. 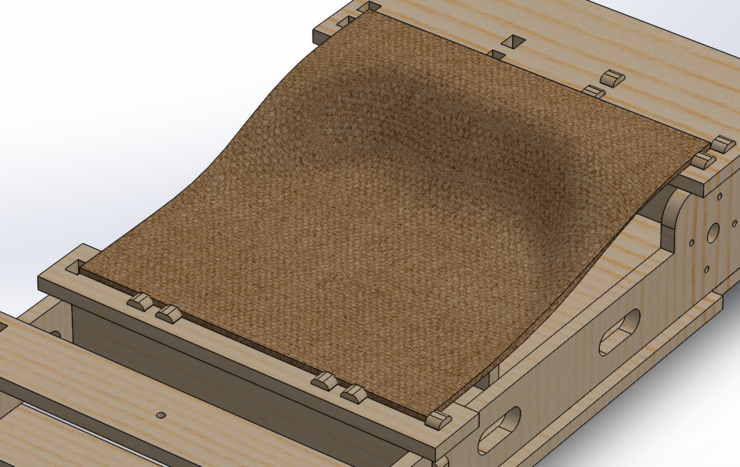 Also in SolidWorks, I designed an organically shaped solid for the go-kart seat to fit with all the other parts of the chassis. 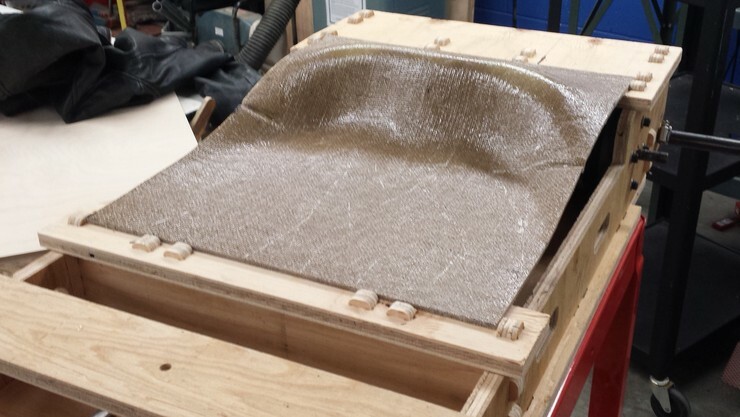 A much more detailed post about constructing the seat is available from composites week. As part of the electronics on the go-kart, I designed a voltage monitor that can be used to read the voltage of the batteries—somewhat like a fuel gauge. The voltage will be displayed on a 44780 LCD panel. The class doesn’t have parts (i.e. 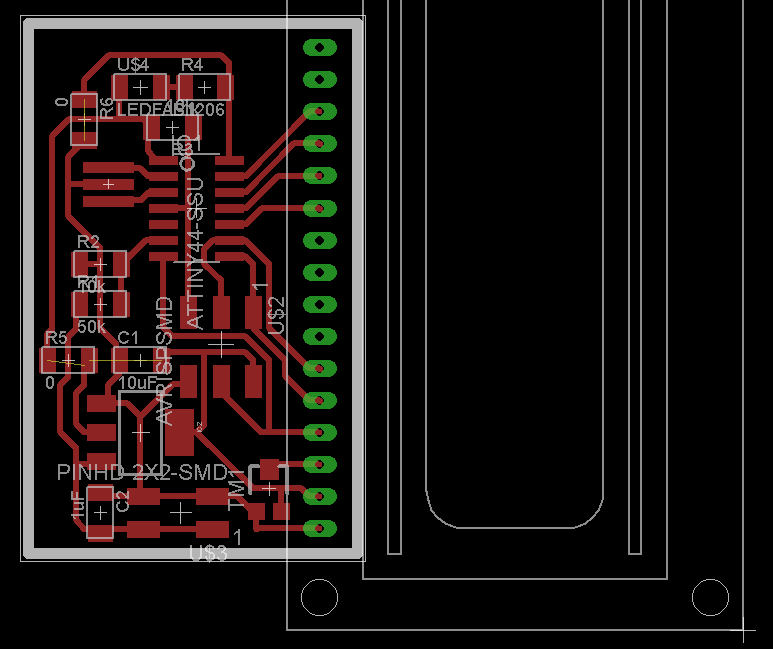 a regulator) that would make it possible to monitor the 36 volts on the entire pack, so I’m creating a monitor that will work on a single 12V battery. Lead-acid batteries have a range of voltages during use, running from 2.1V fully charged to 1.95V fully discharged, per cell. Discharged batteries quickly form lead sufate crystals which prevent the battery from being charged again, so it’s important to prevent the battery from running too low and always keep it charged when not in use. 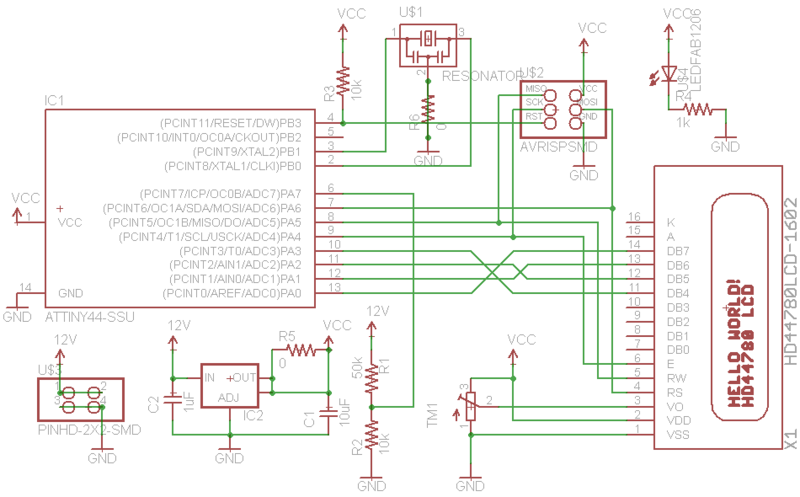 The schematic is pretty straightforward, using an ATtiny44 to drive an LCD panel and a voltage divider to measure the 12V voltage on an ADC pin. The VO pin, or pin 3 of the LCD, is used to adjust its contrast, with a range of values from 5V to 0V (ground). 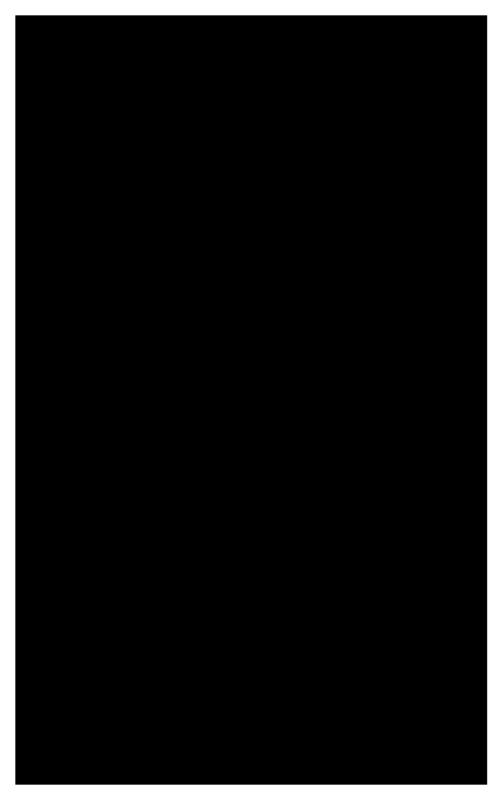 I’m using a trimmer here so that the contrast can be adjusted. 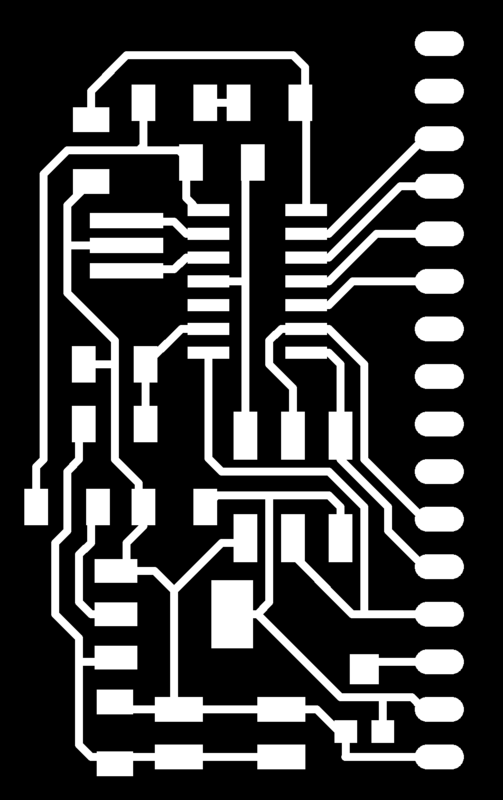 The criss-cross of nets in the center of the schematic was originally straight, but I reversed the order to greatly simplify routing—it doesn’t matter which pins these are as they can be configured later. A few 0 ohm resistors were added during the routing process as well. I’m using the 44780 LCD part from the adafruit library, which also includes a physical layout using appropriately spaced pads with holes. By using the right headers, the LCD panel can be attached directly to the board without having to solder individual wires on a ribbon cable. 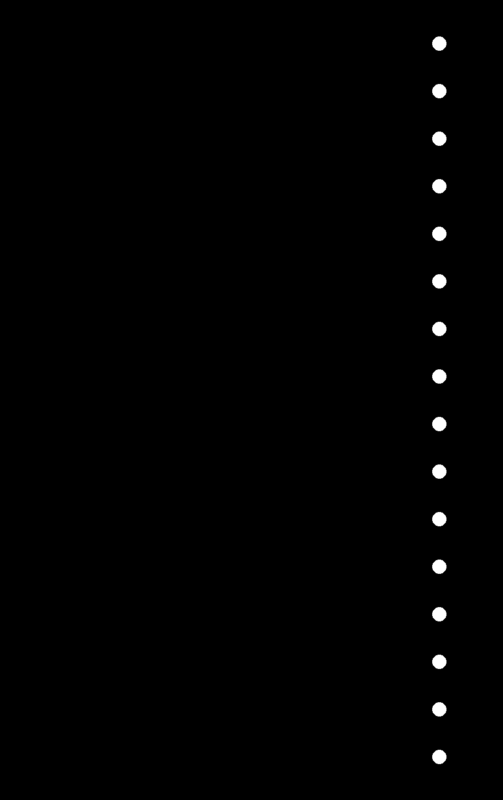 Creating a board with holes involves generating three images instead of the usual two. 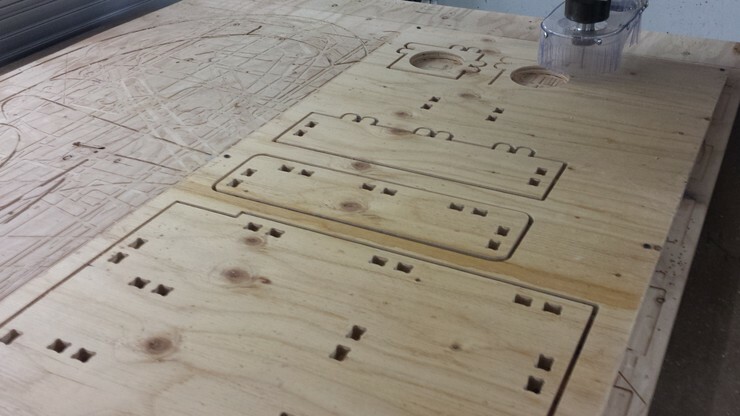 A second PCB outline is created with just the positions of the holes, drilling them with the 1/32” end mill. Finally, the outside outline is cut out as per the usual. 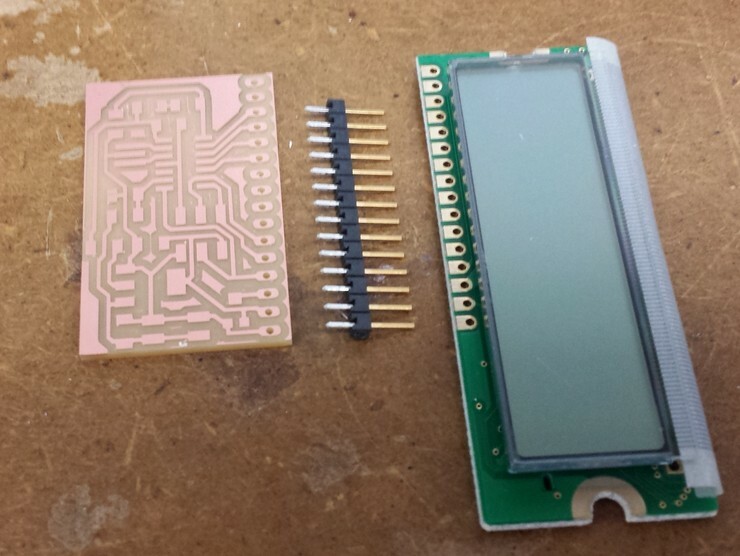 Here’s the completed board, along with the through-hole header and LCD panel, showing how they line up. Before programming the board, I attach it to 12V power source to verify that the regulator is working properly and that there are no shorts. The LED turns on, which is a good sign. I had a bit of a scare when I first uploaded the program, as the LCD wasn’t displaying anything. However, it turns out that this was because the contrast on the LCD was too low. A bit of fiddling with the trimmer and the text showed up! Note also in the above picture that the LCD panel has been soldered to a female header connector. 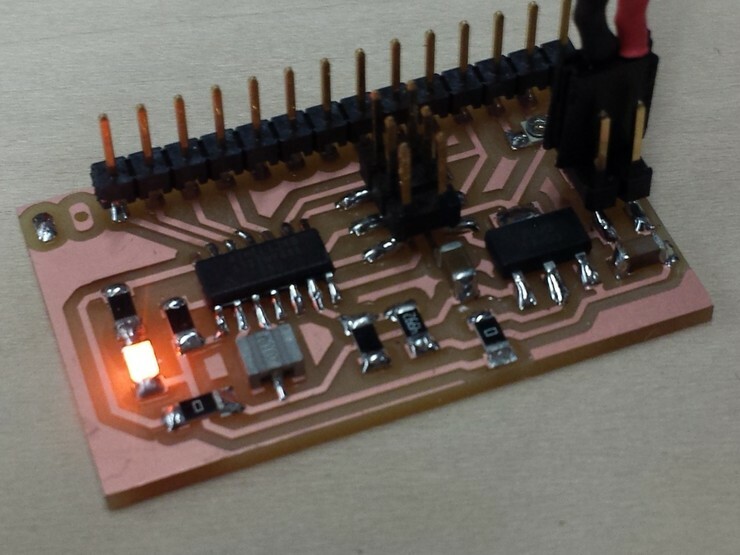 This allows the LCD to be attached and detached from the circuit board while maintaining a good electrical connection. The final code is below. 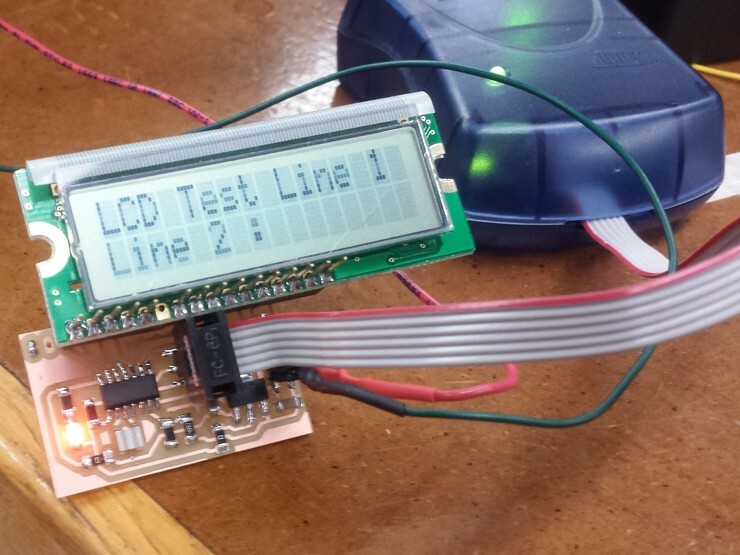 It basically loops between taking ADC measurements and updating the value on the LCD. Note that although the ADC is only 10 bits, and we are presumably measuring (divided) voltages between 1.9 and 2.1V, the 10-bit resolution of 0.005V might seem crappy given that we only expect the measurement to change over a range of 40 steps. However, because we can take multiple measurements and use the average, we can actually get very precise readings—especially after calibration. Including the sprintf function actually bloated the code significantly, to over 2 Kb. As a result, I couldn’t also include floating-point arithmetic, so I created my own fixed-point arithmetic to display the voltage. 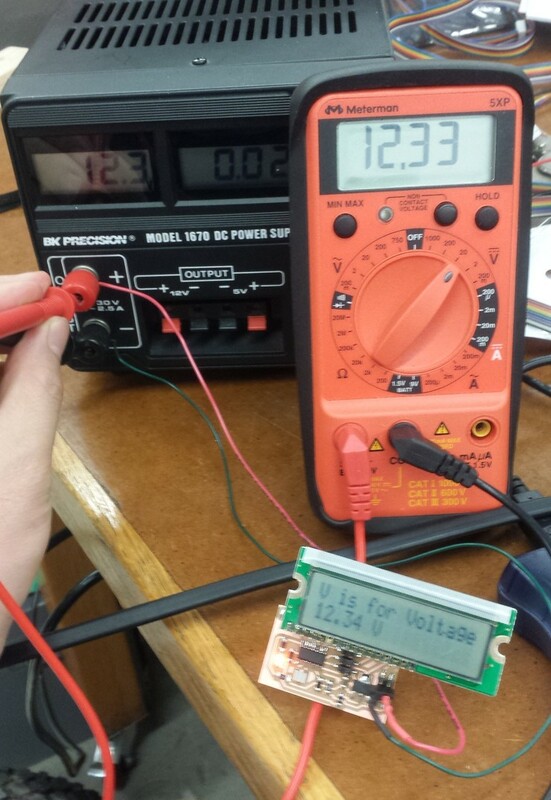 Here’s a test of the final result: the power supply shows 12.3, the multimeter reads 12.33, and the board itself reads 12.34. Not bad at all! If we really wanted extremely precise measurements with this board, it would need to be calibrated to the output voltage of the regulator. However, this particular regulator was very close to 5.00V, so the reading is pretty accurate. 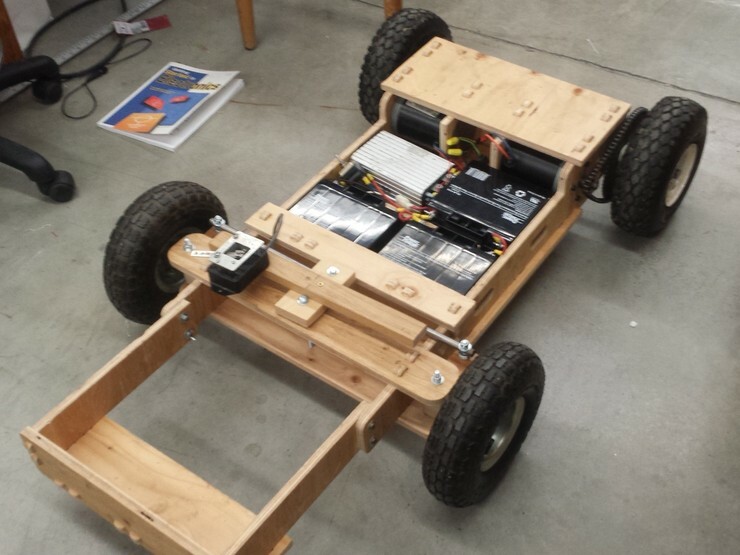 Final assembly of the go-kart involves squeezing the motors, batteries, and power electronics into a pretty tight area, and assembling the chassis. Everything fits together pretty nicely, including the tabs and slots. The entire chassis with the front footrest is almost four feet long. However, this is still pretty compact for a vehicle. Here’s a close-up of the rear, including the motor mounts. I am very happy with how the press-fit panels work, and the motors are snug and straight. The rear axle fits through the hole in the corner; each rear wheel has integrated bearings. Here are all the tabs sticking through the bottom panel. 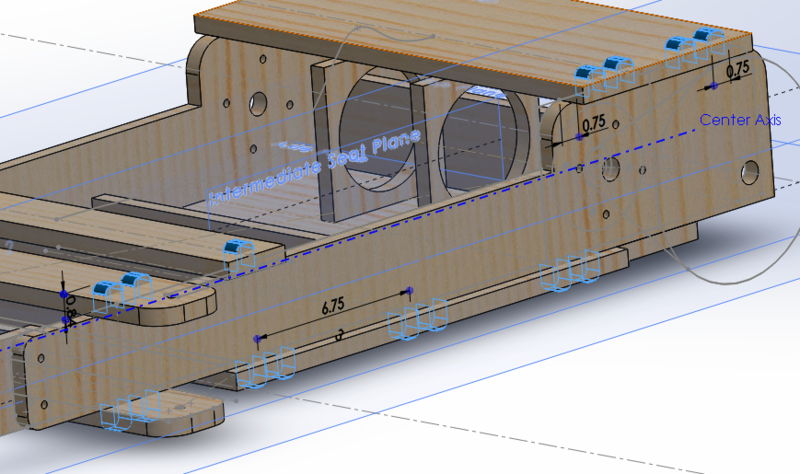 The interlocking joints really help to stabilize the structure, and are a testament to the usefulness of CAD programs to design the entire chassis. A vertical shot of the chassis. At this point, everything is held together by only 4 screws, 2 on each side of the bottom panel into the side panels. This is the only part that needs support; everything else fits by the interlocking tabs and slots. 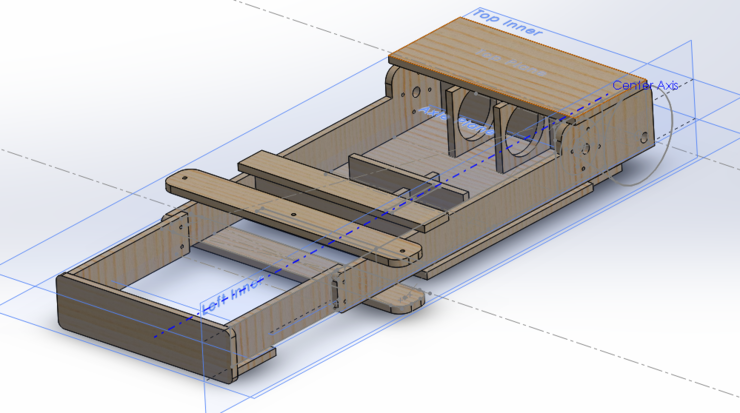 Assembling the wheels and steering…the go kart is getting heavy at this point, so I’m pushing it around on a cart. 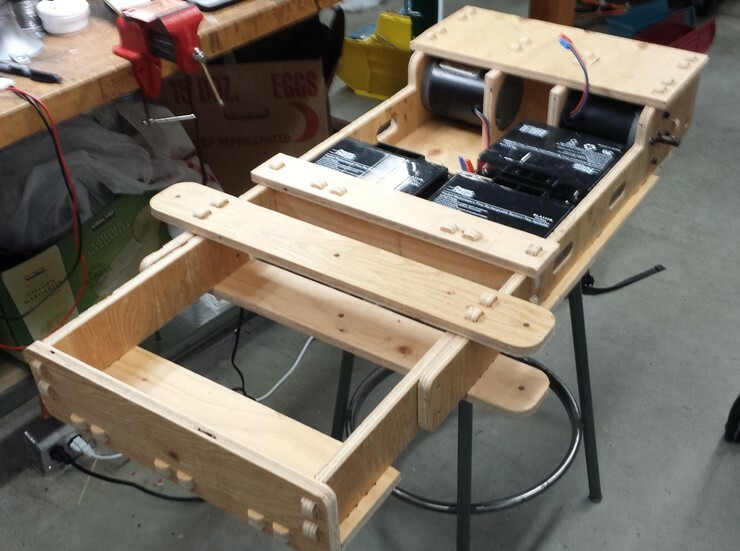 Here’s the final product, with the chain drive on the wheels and the power wiring in place. The steering is a little improvised for now, but it’s drivable—spiral development, right? It’s fast enough to hit 30 mph or more, but there are no brakes yet—so driving at those speeds requires some wide, clear areas. The video at the beginning of the post shows our first road test. Blog for MAS 863 made in Jekyll. See the About page for more details.